You're capable of making a difference! We want to hear it! We are accepting submissions for our next digital edition. Goin' Up The Country - What rural living is like in your state.Your heartwarming and heart aching experiences. Gardening Your Style - Do you believe that farm fresh produce is the real "Farmacy?" Why? Let us know your gardening techniques, and the health benefits you derive. Small Town and Big Town Crafters - Tell us what you do,what you make and why you do it - we're thinking it's for the love of it! Made in My Hometown - What is unique, specific, and only made in your Hometown that you can shine a light on, and are exceptionally proud to call your own? Delicious America - Delicious Zweigle Hot Dogs, Nunda Mustard, Monks Bread, and Once Again Nut Butters are unique to our area of upstate NY. What can you boast about? Explore Our USA - Our sister in NE boasts of "Boot Hill" in Ogallala, where old-time burials were laid to rest in a historic cemetery, and the dead were generally buried with their boots on - hence the name, "Boot Hil." In upstate NY we celebrate Letchworth State Park, considered "The Grand Canyon of the East." What should we explore in your state? Tell us about your Creativity - We love fine art - ideas, photography, poetry, - and just about anything that the right side of the mind delivers - please send us your work! Stuck for ideas? Here is a great site that gives Information & Inspiration! And they already have each month for 2014 ready just click it! From bloggers, artists, and high school students to civic groups, and universities - Free Speech Week is for you! Four little words- that make a profound difference to all who hear it. The annual event of acknowledging the people who matter to each of us. Thanks to Brownielocks.com for their extensive research in compiling this list. 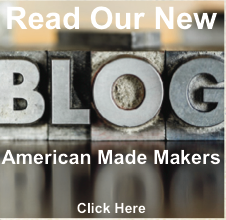 Artisans: An endless variety of unique, quality, handmade products at affordable prices.﻿ Our USA Magazine is proud to feature all artisans in our support of USA small business owners. Please email us for special rates. We are animal lovers and love all those four-legged little critters who really don't care if we are too fat, or snore or don't exercise enough - those special little guys who give unconditional love - our pets. Send in their stories and photos and even a video if you have one!﻿ We are hoping to have a special section on horses - so if you have had any experience with these strong, gentle, beautiful creatures - please send in your Horse Tales. If you know about a new and interesting website or business that you think many of your neighbors and friends would benefit from and enjoy, please drop us a line and let us know about it. It just may be spotlighted in the next Serendipity feature. Send in your photos of our beloved ‘Stars and Stripes’ and it might just make it on the cover of the magazine! 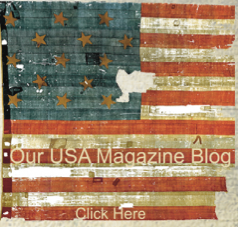 As a continuing theme for Our USA Magazine, we would like to display “Old Glory” on the cover of each issue. From the White House to your house, to outer space, the flag of the United States is one of the nation’s most widely recognized symbols. Show your pride, and send in your photos! Please see photo requirements page. Our Back in the Day feature highlights memories of each era - whether you were born in the 30s, 40s, 50s, 60s, 70s, 80s or 90s - there is something relevant to each decade. Remember when there were no childproof lids on medicine bottles, or sharing your drink from the same bottle with four of your friends, or riding your bike wearing a baseball cap on your head, and not a helmet? Send and share your memories with us. Representing Our Country. We can't help but hear all the gloom and doom that is spreading like wildfire across this country, but there must be some inspirational, encouraging stories too! Along with our military men and women who give selflessly, what about the firefighters, police officers, teachers, nurses and every other hard- working person who represents this country, doing what they do best! We want to hear from, and about them too! My Hometown – Bruce Springsteen sang – “Take a look around - this is your hometown.” Take a look around your hometown and tell us what it means to you. What makes your town like no other. How do you celebrate the 4th of July - baseball, hot dogs, apple pie and the traditional parade down main street? Let us know what makes your town unique. We would like to do a photo feature in each issue of your children and grandchildren. If you can answer the question of what are little boys made of, and then of course, what are little girls made of...you'll know what we're looking for! (Some call it "The Sink Day" when you eat over the sink all the Thanksgiving leftovers.